This fascinating 13 day Arctic cruise takes you through spectacular Greenland and an enchanting Iceland! Plunge into a world of wilderness, valleys, fjords and islands. 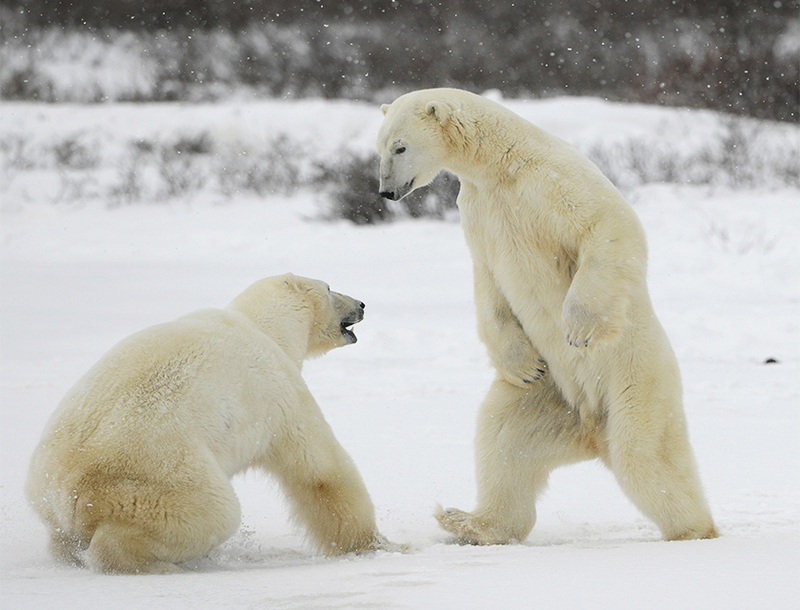 Here's your once in a lifetime opportunity to experience the mesmerizing polar region! Today, we arrive in Longyearbyen, the administrative capital of the Spitsbergen archipelago, of which West Spitsbergen is the largest island. Before embarking on this spectacular journey, you can take a stroll around this former mining town, whose parish church and Polar Museum are well worth a visit. Early evening, the ship will sail out of Isfjorden. 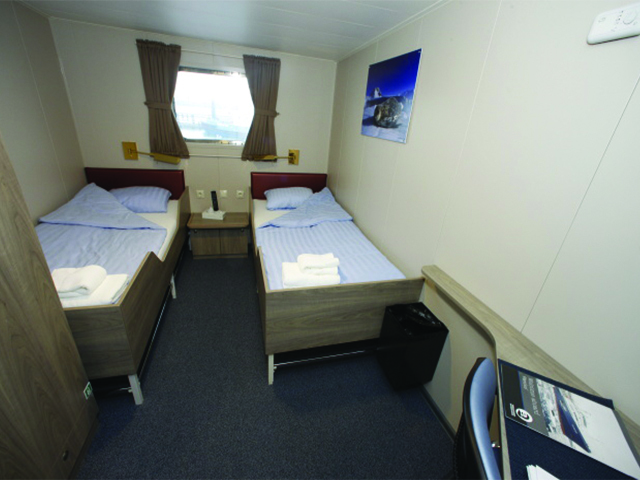 For the next twelve days our stay will be aboard the M/v "Plancius", a vessel with 53 passenger cabins and a capacity to accommodate 114 passengers. Our expeditions in North-East Greenland are planned in August and September. The reason is that access to this wild coast is dependent on the ice conditions. 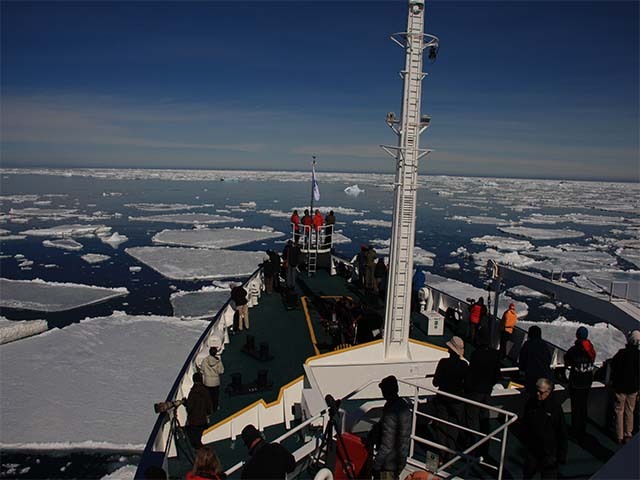 For much of the year the region is locked in by pack-ice, which only by late summer has broken up sufficiently to allow vessels such as ours to reach land. We sail into Raudfjord on the north coast of West Spitsbergen, a beautiful fjord with spectacular glaciers. It is home to Ringed and Bearded Seals, seabird colonies and surprisingly rich vegetation. Here, we have a good chance to see Polar Bears, for instance, near Hamilton Glacier, or more towards the head of the fjord. 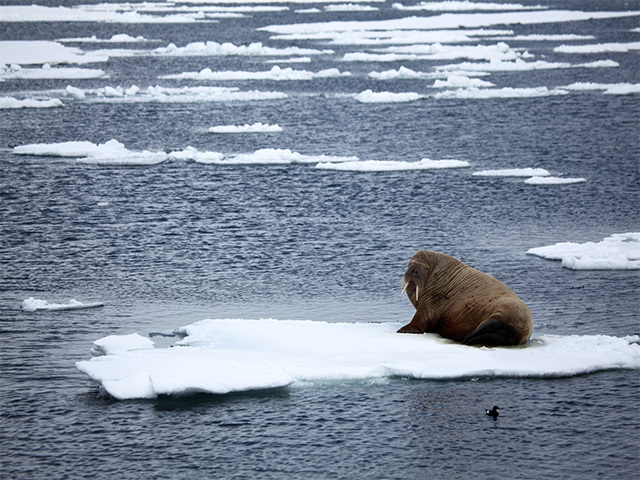 From Raudfjord we continue to Moffen Island on which Walruses haul out. The next two days are spent at sea, where we voyage to Greenland. Enjoy the blue of the sea, catch sight of the edge of East Greenland sea-ice and watch out for Whales and migrating seabirds! Approaching Greenland, we will attempt to sail through the sea ice into Foster Bugt, making our first landing at Myggebugten. Beyond the old hunters’ hut (in the first half of last century Norwegian trappers hunted here for Polar Bears and Arctic Foxes), there is an extensive tundra populated by Musk Oxen. The small lakes are home to geese. We sail through Kaiser Franz Joseph Fjord, a magnificent fjord with towering mountains on both sides. Its inner sides are choked with huge icebergs. As an alternative, we can sail through Sofia Sund, which is much narrower. On this route, we can see Musk Oxen from the ship. The northernmost regions of Greenland, or "Kalaallit Nunaat" ("Land of the People") as it is known in the Greenlandic language, is the largest island in the world. It stretches from 60º to 83º north latitude. Kap Farvel, its southern tip, is located at almost the same latitude as the Shetland Islands in Scotland. The extreme north of Greenland is the northernmost point of land on our planet. Greenland is dominated by the second largest ice-sheet in the world; more than 80% of its surface area is covered by ice reaching a thickness of over 3000 meters (10,000 feet) in the interior. Although huge in size (2,166,000 km²), it is inhabited by less than 60.000 people. Greenland is geographically a part of the North American continent but has additional social and political ties with Europe. The coastline of Greenland is spectacular. It is heavily indented with numerous fjords, consisting of spectacular high mountains, cliffs at a height of 2000 meters (6500 feet) and innumerable glaciers. The large glaciers produce the huge, cathedral-like icebergs that are abundant in Greenlandic waters. The largest fjord is Scoresby Sund and is more than 300 kilometres (185 miles) long. Today, we will land on shore in Blomster Bugt to see some beautiful geological formations. Arctic Hares are usually seen here, and there is a lake where one can spot Great Northern Divers with their young. In the afternoon, we sail along Teufelschloss and Ella. Today, we reach Scoresby Sund and sail in the morning along the ragged and glaciated Volquart Boons. Scoresby Sund, or Kangertittivaq as it is known in Greenlandic, is the longest fjord in the world spanning over more than 350 kilometers (217 miles) in length. Here we may organize a zodiac cruise, (a cruise where zodiacs, or small inflatable boats that have a capacity of around ten to eleven passengers, are used), along one of the glacier fronts of this coast. Our first landing will be at near Maane Glacier. Later, we reach Danmark, where we find the remains of an Inuit settlement abandoned around 200 years ago. The circular ‘tent rings’ of stones indicate the summer houses, while the winter houses can be seen closer to a small cape. The sites are excellently preserved, allowing entrances and bear-proof meat caches to be identified. There are also grave sites that may be visited here. In the evening, we continue our journey and sail through the beautiful fjords to the west, choked with icebergs. Day nine finds us ashore at Cape Hofmann Halvø, a reliable spot for viewing Musk Oxen. We may also spot Rock Ptarmigans, and Great Northern Divers here. The landscape here is particularly beautiful, especially during autumn when the dwarf willow and dwarf birch change color. Don’t miss the exceptional beauty of the Arctic blueberry and crowberry that add their vibrant touch to the color studded vegetation! While you admire the colors, try and get a taste of the berries too! In the evening, we sail through the fjord towards Scoresby Land, enjoying the contrast between the warm autumnal colors of the vegetation on shore, against huge dark mountains, and the cold blue of the icebergs. In the morning on day ten, we encounter huge icebergs, some over 100 meters high and more than a kilometer in length, in Northwest fjord at Scoresby Land. Most of the icebergs are grounded, as the fjord is only about 400 meters deep here. We land near Sydkap to view the remains of winter houses built by Thule people. As many as 20 people lived in these tiny houses, hunting Greenland Whales and using their vertebrae to build the houses. We may also land at Gurreholm on Jameson Land. The landscape here is gently undulating. On day eleven, in the morning, we land at Illoqqortoormiut, the biggest settlement in the Scoresby Sund with about 500 inhabitants. At the post office you can buy stamps for your postcards, or just wander around to see the sledge dogs and the drying skins of Seal, Musk Ox and Polar Bear. After dinner, we sail south passing the amazing landscape of the Blosseville Coast. Day twelve is spent entirely at sea. Here’s your chance to catch sight of large Whales and seabird migration and, don’t miss the Aurora Borealis (Northern Lights) at night time! Iceland is situated in the middle of the North Atlantic Ocean, about 800 kilometers north of Scotland and only 280 kilometers from Greenland. Although the vast majority of Iceland is located below the Arctic Circle, a small island, Grímsey, is situated directly on the Arctic Circle. The island is geologically very young; it was created only 16 to 17 million years ago on the Mid-Atlantic Ridge by the movement of the American and Eurasian tectonic plates. The Mid-Atlantic Ridge is still visible at Þingvellir (Thingvellir). There is a lot of geothermal activity in Iceland, with about 800 hot springs including geysers. The first people who probably set foot on Iceland were monks from Ireland. They settled in the 8th century. Around 870 A.D., the first Norsemen, settlers from Norway, arrived and drove away the monks. Over the centuries more settlers arrived from Norway. Today, Iceland is a modern, technologically advanced country within 5 hours of the east coast of the United States. It is the ideal place for taking a break and for visiting a European outpost with an exciting, lively, and ancient culture all of its own!! On the last day of the arctic adventure tour, we arrive in Akureyri and are taken by a chartered bus through North Iceland to our hotels in Reykjavik. This is a 6 hour drive. In general we plan to offer at least 4 days for kayaking. Basic kayaking experience is required and physical fitness is essential for this activity. Parallel to all other activities we are planning on offering kayaking excursions during morning and / or afternoon landings. The final decision on those excursions will be met by the Expedition Leader. We will provide kayaks and neoprene wet suits. Kayakers will have to bring their own personal gear. Kayaking is subject to weather and prevailing ice conditions. On Northeast Greenland voyages: Transfer and baggage handling between ship in Akureyri and hotels in Reykjavik by coach (5 hours).